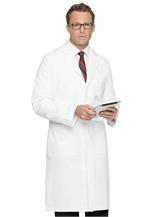 This 31" Men's consultation lab coat features a vented back, lapel collar, multi-pocket including three outside pockets, three inside pockets and a breast pocket. Center back length is 31". Made of 65% Polyester / 35% Cotton Twill with Soil Release.